This article proposes a conceptual framework for describing business organizations as complex systems, much like live organisms, whose parts function in an orchestrated manner for the sole purpose of creating customer value. The impetus behind it was the growing realization that while most business publications focus on the tactical aspects of running a business (the “how” of the business), few tackle head-on are the foundational principles of strong business models (the “why” of a business). In the prior article, Enterprise Process Map (Part 1 of 2), I promoted enterprise process maps as a tool to enhance operational clarity and create a shared view of a company’s capabilities. It is this shared perspective that accelerates business planning and improvement activities as the time to get everyone on the same page is vastly reduced. In lieu of such a foundational view, leaders setting strategy are essentially planning a road trip without awareness of the roads to the destination. A successful digital business initiative relies upon adopting agile principles, an enduring focus on improving customer experience and executing programs with a business process based view with enabling digital information technology. Measuring what matters to customers and challenging the current operating model of the business are two important characteristics of digitally mature organizations. A September 2015 survey of 150 Operational Excellence (Op Ex) professionals found that 38% of respondents listed Customer Experience (CX) as their number one priority in Op Ex. That’s both good news and bad news. The good news is that nearly 4 out of 10 Op Ex professionals recognize that CSX is central to Op Ex success. The bad news is that 62% – don’t. There’s no doubt that Op Ex success also relies on other factors such as leadership and culture. But if an organization doesn’t put customers first – they may find themselves optimizing to a decreasing share of the market. Op Ex professionals will recognize the importance of focusing on customer experience as it has been part of the lean movement since 1988. 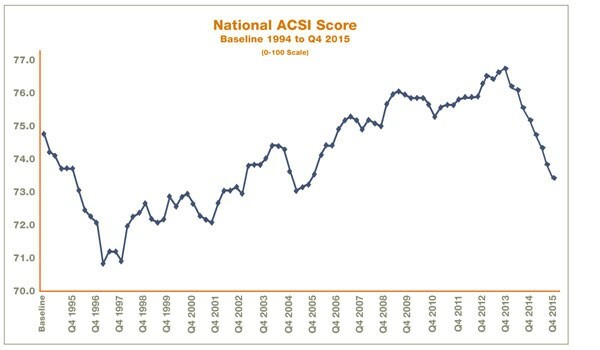 It’s worthwhile noting that the ACSI score for Q$ in 2015 is well below the baseline 1994 level. This is just one indication that customers’ expectations are outpacing the ability of organizations to deliver. For any organization to prosper, its leadership must drive bottom line results, expand the product offerings, and identify opportunities to better strategically position the organization. But all too often they look to trendy business practices or copy the competition. They don’t know the answers to basic questions: How do things really work and fit together in this organization? What does the customer really want from us? Who really does what and where do I fit in? How can I move the ball forward? Without these answers, the organization’s innovation capabilities are limited. In the modern Digital world, Customer Experience is a critical factor for success in BPM. Organizations can apply Design Thinking framework to map the right emotional innovation factors and succeed in the BPM transformation.